First off, two things before we jump into today's product review. First, I can't believe it's July already!! Summer is just whizzing by. Second, I hope the new tweaks around the site have made it easier for you to navigate around the blog! 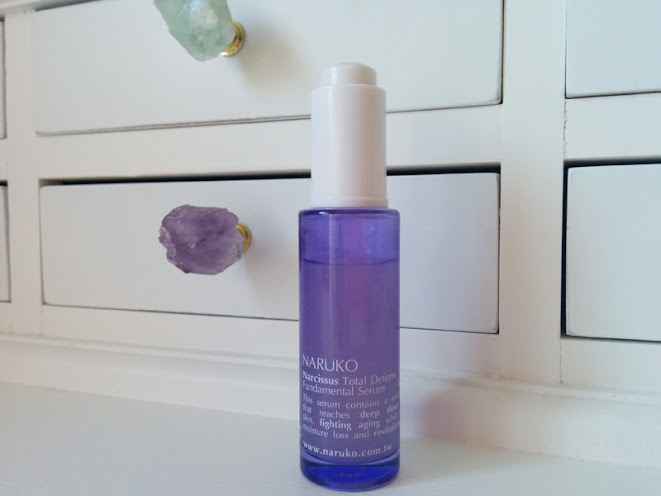 Today is the third post in the Naruko Mini Series, and it'll be a review of the Narcissus Fundamental Serum! The Narcissus line is targeted towards those with young skin that is just starting to see the effects of aging. The product claims that it will whiten your skin (targets hyperpigmentations & uneven skintone), tighten, and prevent moisture loss. While it didn't live up to all three claims, it did live up to one of them! Find out which one after the jump! 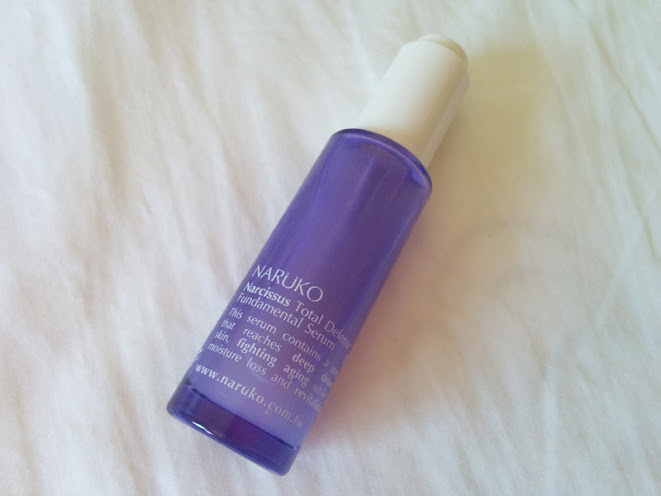 I was gifted this serum, and I am aware that I have the older version of the serum because Naruko renamed and revamped some of their products a while back. The new version of this serum is called the Narcissus DNA Repairing Serum. For all intents and purposes, I believe it's pretty much the same product. Unfortunately, I left the box in California since I only had room in my carry on to bring the actual products back with me to New York!! I also tried Googling the ingredients to no avail. However, I'm pretty sure it has similar ingredients to the Narcissus Night Gelly which I already reviewed here. This serum contains a special formula that reaches deep down into the skin, fighting aging while preventing moisture loss and revitalizing the skin. After cleansing skin, apply an appropriate amount to face evenly. The color of the serum is milky opaque. Comes with a built in dropper. 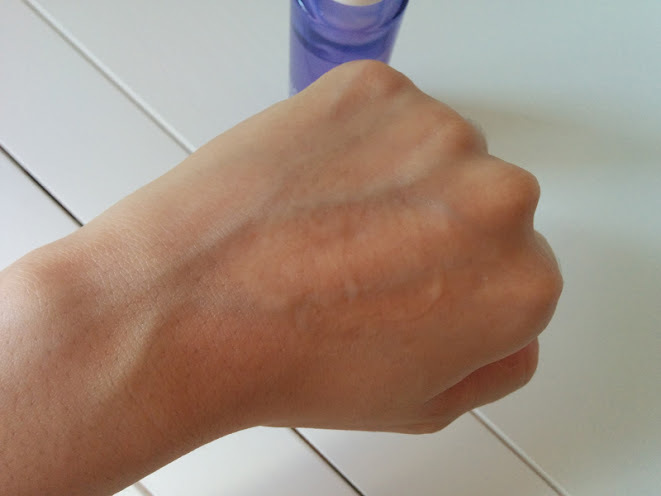 The texture of the serum on the skin before rubbing it in. Texture of the serum transforms into a thin water-like consistency after being rubbed in. Like all the products in the Narcissus line, the product is housed in a nice and sturdy purple tinted glass bottle. As you can see, I've made a noticeable dent in the product after using it for a little more than a month. I use this serum once a day in the morning with my daytime moisturizer, toner, and Nature Republic's Essence. 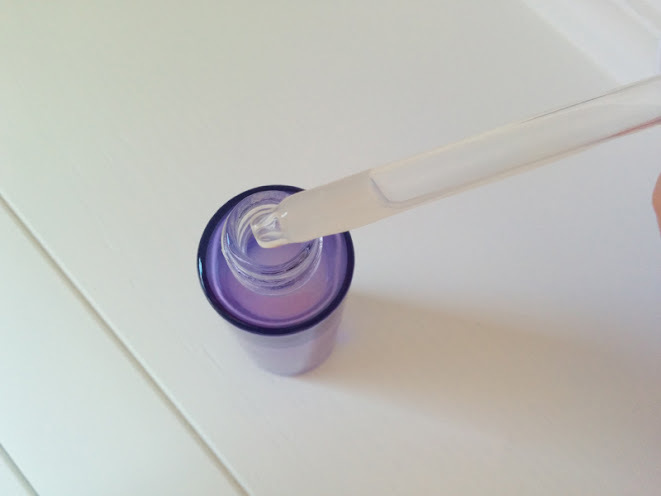 The dropper is very generous in dispensing the product per drop, so I only use one drop for my face and it's more than enough to cover my face and the upper part of my neck. The product smells odd. It doesn't smell like a traditional face product (which are usually light, relaxing, floral, etc), but it is very lightly scented. I don't like it, but fortunately I don't smell it at all when I'm putting it on my face. The product claims to whiten, tighten, and prevent moisture loss. I've found that it does live up to its claim of preventing moisture loss since my skin seems to be less oily throughout the day, and it helps soak in my daytime moisturizer more effectively. It hasn't irritated or stung my acne-prone skin at all, so I think it would be appropriate for those with sensitive skin. Like all of the Naruko products I've tried so far, the texture of the product transforms as you're rubbing it into your face. 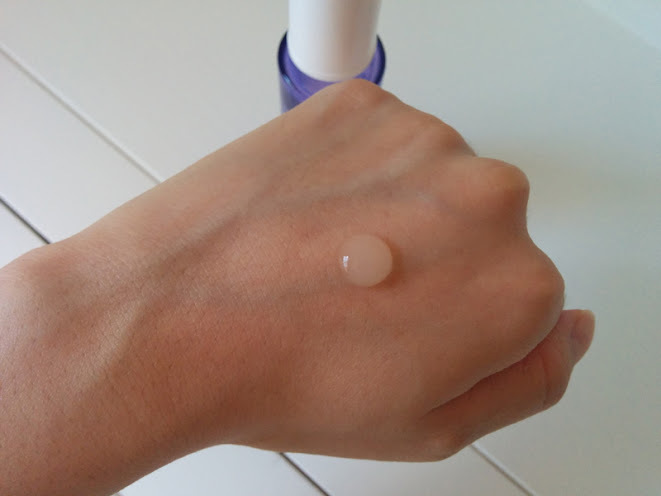 Just like how the night gelly melts into this hydrating slightly sticky moisturizer, the serum goes from a fairly thick texture into a watery and thin layer on your skin. Subsequently, it's easy and fast to apply and it absorbs very quickly. Overall, I'm happy with its moisture retention benefits. It's the perfect amount of hydration in the summer, but I might have to switch over to a slightly more moisturizing serum for the winter. Would I purchase it again? I'm not sure to be honest. I think it's a product I could live without when it comes to the bottom line, but I might consider it if it's on promotion or discounted. You want a light to moderately hydrating serum. You want a serum that helps your skin maintain moisture more effectively. You have sensitive skin and are usually prone to breaking out from other serums. You want a serum that absorbs quickly. You want to target your fine lines. Your skin is dry and needs a heavily moisturizing serum. You're very sensitive to scented skincare products. If you're interested in trying out the serum or any other Naruko products, you can purchase Naruko from their online ecommerce site, Amazon, and Sasa. The new renamed version of the Fundamental Serum is the Narcissus DNA Repairing Serum. 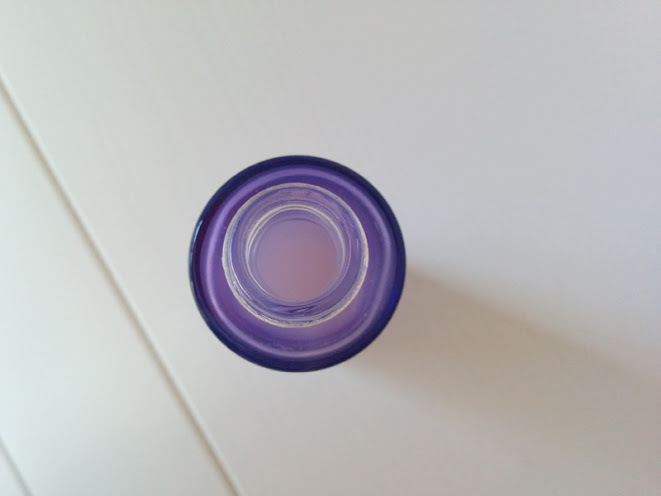 It looks exactly like the Fundamental Serum and is housed in the purple glass bottle with the built in stopper. I also mentioned that the stars of the Naruko line are the gellies. If you're thinking about trying only one product from Naruko, definitely try out their gelly moisturizers.